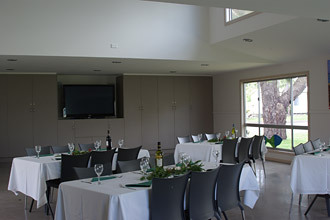 As an informal space, the BIG4 Port Fairy function area provides spacious meeting and dining facilities for reunions, social clubs, interest groups and family gatherings. Port Fairy is a popular destination for participants from diverse locations to meet up. 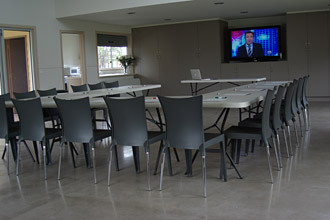 Facilitators and Event Planners, this versatile facility can be configured for formal meetings, breakfast functions, conferences, training seminars, workshops, networking sessions and more. See the wide range of park facilities available to ensure all members of your group enjoy their stay and spend their time constructively. Tour Group Leaders can provide their group members with accommodation ranging from powered camping sites to luxury cabins. Our well equipped kitchen is available for your chef to use and the function room offers ample space for relaxed and enjoyable dining. See more park facilities by clicking here. 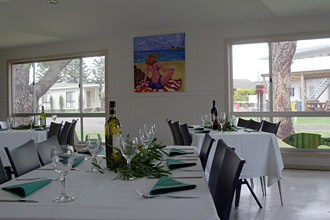 See more activities around Port Fairy under Things To Do.